Ukiyo-e (pronounciation:uː.ˈki.oʊ.ˌeɪ, uːˌkiːjəʊˈeɪ. 浮世絵 in kanji) is essential field in Japanese art . The art never developed without the common people of the Edo Period. It is said that the beginning of the ukiyo-e, the Japanese art of woodblock printings, is the pictures of Kyoto people’s living in late 16th century. After that, the themes of ukiyoe expanded to popular kabuki actors, beautiful women and landscapes. “ukiyo” （浮世） means contemporary with hedonisitic and fleeting idea, so ukiyo-e translated as picture of floating world. The source of ukiyoe was Yamato-e (大和絵, traditional Japanese painting) but drew the line from the field of China art including the Kano School (狩野派). The ukiyo-e artist made the artworks for not the warrior (samurai) class but the ordinary middle class citizens. So they basically created the paints for a woodcut to sell them in low price. Comparing other Japanese art, it is distinct charactheristic. The person who is supposed to be the origin of ukiyo-e is ,in early Edo Period, the woodblock prints artist Iwasa Matabei (岩佐又兵衛). It is said that he was the son of samurai warrior, but it is not known what kind of person was. Also, it was Hishikawa Moronobu (菱川師宣) in the middle of the Edo period that introduced woodcut prints. It made the ukiyo-e artists and the publishers offer pictures to a wide range of people. Until then, the name of artists did not appear on the work, but he distinguished his name clearly. After that the Japanese woodblock artists followed the way. In the early, ukiyo-e had just single color printings, “sumizuri-e“（墨摺り絵） until the middle of 17th century. And on the next the stage, it bacame to be put on them color by brushes and called “tan-e” (丹絵). Tan meant lead oxide used mainly for the single color woodblock printings. In Kyoho Period(1716-1736), redcrimson (紅) or lacquer took the place of lead oxide. It was the term of “beni-e” (紅絵) and “urushi-e” (漆絵). The coloring tecnique was introduced to woodblock making in 1744. The ukiyo-e industry began to publish the two colors, redcrimson and grass green, printings called “benizuri-e” (紅摺り絵). Suzuki Harunobu (鈴木春信） and others devised multicolored printing, “Nishiki-e” （錦絵）, in 1765. And they had been something like advertising posters or flyers. Then famous artists including Kitagawa Utamaro （喜多川歌麿） , Katsushika Hokusai （葛飾北斎）, and Utagawa Hiroshige (歌川広重)made them works of art. The price of ukiyo-e will be explained later, but even in this era, the woodblock printings was so cheap that ordinary people could easily purchase. When we think about ukiyo-e, we just imagine a woodblock printing (版画, hanga). But it includes an original painting (肉筆画, nikuhitsu-ga). The famous ukiyo-e artists drew both for a woodblock printing and an original painting. In 1867, Edo shogunate participated in Paris Exposition. Japanese woodblock printings were displayed but also used wrapping papers for potteries and lacquerwares. But the ukiyo-e prints had already introduced Europe decades before with same way. Vincent van Gogh also learned the world of Japanese floating world art as the wrappig paper. According some reports, he had more than 200 ukiyo-e woodcut. He wrote the letter to his brother Theo that all his works somewhat based on Japanese art. Not only Gogh, many impressionism artists, Édouard Manet, Claude Monet, Edgar Degas, Paul Cézanne and Henri de Toulouse-Lautrec were inspired by the ukiyo-e artworks. At the end of Edo Period, the improvement of woodcut technology became impressive. For example, the technique of Kiwari(caving hair) was a sophisticated technique of digging three hairs in a width of approximately 1 mm. In this period, the era has historically changed greatly, so ukiyo-e also took on a role as a kind of news report. However, when Western printing technology came to Japan in the Meiji period, the ukiyo-e paintings that lost the competition gradually and diluted their presence. Meanwhile, Tsukioka Yoshitoshi (月岡芳年) and Kobayashi Kiyochika (小林清親) left works that enhanced artistry. The technique of ukiyo-e was inherited to the artists of shin-hanga(new woodblock printing) such as Yoshida Hiroshi (吉田博) and Kawase Hasui(川瀬巴水). Now, how to make old Japanese woodblock prints after a planning came to a decision between a publisher and painter? A ukiyo-e printing wasn’t made up by one person. An ukiyo-e painter “e-shi”（絵師）, carvers “hori-shi”（彫師） and a printer “suri-shi”（摺師） were included the set of the work. A suri-shi prints every colors one by one. The eshi advises him at the work. It didn’t mean that the eshi people could draw a rough sketch as they like. The publishers, “hanmoto”（版元）, requested the works. So the eshi had to consider as being along the intent of their clients. The work of carving was a large amount, so this process was carried out by some horishis. It took about ten years to become fully qualified horishi. The works of printing also needed advanced techniques that allowed no deviation coloring and outstanding blurs. The themes of ukiyo-e cover very wide range from a beautiful woman to caricature. It is the proof the Japanese woodblock print was a part of the life in Edo Period. Click on the picures to see in full size. The models of “bijinga” were a prostitute, a girl and a wife of a street, a geisha, and an actor who plays female roles. Kitagawa Utamaro is generally admitted as a leading artist of the area. In addition, Suzuki Harunobu, Torii Kiyonaga(鳥居清長）, Katsukawa Shunsho（勝川春章）, Katsushika Hokusai, Utagawa Toyokuni(歌川豊国）, Utagawa Kunisada(歌川国貞). Keisai Eisen（渓斎英泉), and Nishikawa Sukenobu（西川祐信) are famous for Bijinga. Watching the women woodblock printings, you might have thought like this. “All of their faces look the same.” Of course, it because that we belong to the different countries or cultures, but Japanese also can not distinguish the faces at once. Most of the bijinga don’t really show the images of the models except the artworks of Utamaro. The women actually existed at that time, but the publishers and painters made them into the ideal images of a beautiful woman for people. However, you will find the difference between the artists of the same age if you watch carefully. Kunisada and Kuniyoshi were fellow disciples of Utagawa Toyokuni. 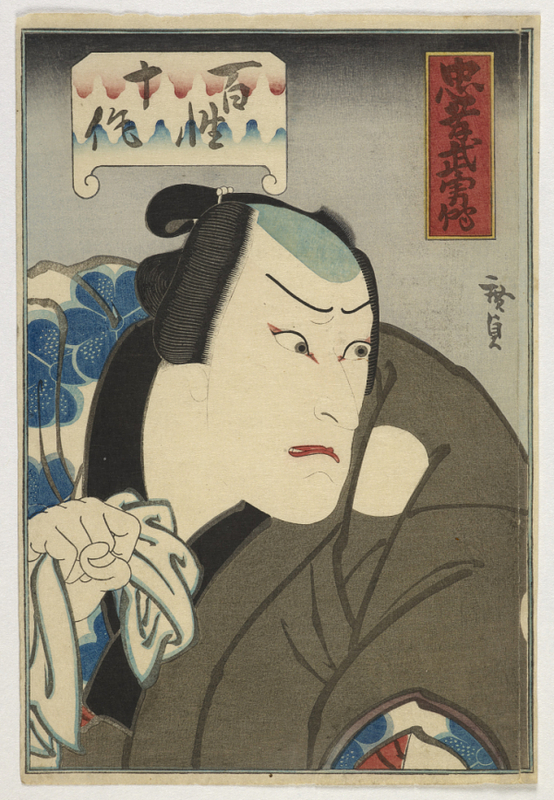 But the Kunisada drew a sensitive and modest woman while Kuniyoshi painted lively and frank. And an ideal image of the beautiful woman had been changed as time passed. They were gender neutral and the body line was delicate in the early period. But in later 18th century, the woodblock artists including Kitao Shigemasa, Katsukawa Sunsho, and Torii Kiyonaga made it plumper cheeks and a healthier build. Furthermore the master of bijinga Kitagawa Utamaro added sultriness for his drawing of the beautiful woman. Yakusha-e is the important genre of ukiyo-e as well as Bijinga. It is dipicted an actor of kabuki on or off the stage. The works of Katsukawa Shunsho, Toshusai Sharaku（東洲斎写楽）, Utagawa Toyokuni, and Utagawa Kunisada are popular in this field. Yakusha-e woodblock printings was a portlait at any rate, but it didn’t aim at realism as well as bijinga. Two ukiyo-e artists would have drawn in an absolutely different way even if a model of a kabuki actor was the same person. Some artist emphasized a nose and another focused on eyes. It totally depended on their sense. For example, Toyokuni depicted the features of the actors but he wouldn’t lose the overall balance. On the other hand, Sharaku didn’t care to idealize the actors and painted the features of the actor’s face so clearly. All of the kabuki actors has been men, so female roles are also played by them. Toyokuni drew the female role as ladylike, but Sharaku expressed the craggy shape of the faces. Meisho-e had been also drawn as one of the field of Japanese paintings(Yamato-e 大和絵）, but in ukiyo-e, hardly seen before Utagawa Hiroshige and Katsushika Hokusai established firmly. The landscape paintings of ukiyo-e has two types. One of the subjects is a specific scenery and people living there. The other is a point of view from a traveler. Both of them inseparable with human life. Meisho-e is the leader of Japanese woodblock printings like a bijinga and yakusha-e but it became popular behind them. In mid 19th century, Hokusai’s “Thirty-six Views of Mount Fuji”, “Oceans of Wisdom”, and Hiroshige’s “Fifty-three stages on the Tokaido” became the rage and the landscape woodcut established the primary status. The background of the success was the fashion of travel and improvement of the technique. The people went on a trip as a leisure and sight-seeing all around the country. It made them get interested in the images of the landscape. And the Japanese woodblock printings introduced the laws of perspective during that time. Above all the carving and printing became able to express some ways of shading. So the sky, sea, and night showed the subtle tint. That also won the people’s hearts and minds. Most of the school drew the theme of Kacho-ga including the flowers, the birds, the fishes, the beasts, and the insects. Comparing to bijinga, meisho-e, and yakusha-e, the number of the works are not so much. But Hokusai and Hiroshige were really good at the theme. And the early period of Utamaro’s works “Picture Book: Selected Insects” have gotten a high evaluation. The ukiyo-e artworks of musha-e include the images of Japanese and Chinese warriors throughout the histories. It also contains the fictional characters such as Utagawa Kuniyoshi’s series of “Water Margin”. He was the representative artist for musha-e. 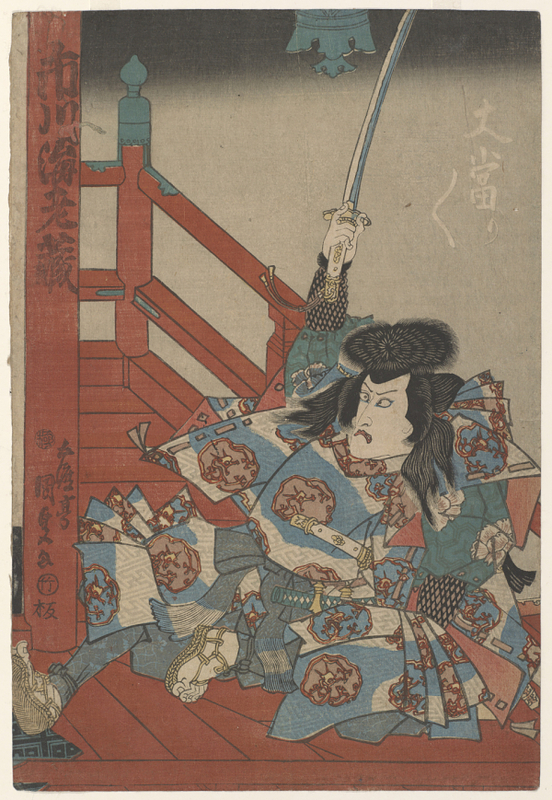 The warrior’s prints have a long history as a genre of ukiyo-e. In 1672, the picture book “Samurai Hyakunin-isshu” by Hishikawa Moronobu was published. That means it started in almost the same time that ukiyo-e woodblock printings were born. Toriki Kiyomasu (鳥居清倍) and Okumura Masanobu (奥村政信), Katsukawa Shunsho, and Utagawa Toyokuni left the powerful works, but Kuniyoshi finished up the world of musha-e. He invented the methods of using three large size papers, the contrast of the colors, and bold compositions. The later ukiyo-e artists who drew a musha-e follow the way of Kuniyoshi not only his disciples but also other schools. Sumo-e depicts a portrait of the wrestler or the ceremony of entering the ring. It began around the time of Horeki and became popular in Tenmei and Kansei. The price and size of ukiyo-e depending on the periods, but I’ll introduce the main of those after the nishiki-e was established in the latter half of the 18th century. There are not much documents left about the price of ukiyo-e, but it is certain that the woodblock prints were pretty cheap compared to the original. According to the essay “Chirizuka-dan” by Ogawa Akimichi, a benizuri-e was sold for 4 mon. Mon was the currency in Edo Period. 1 mon is mostly the same amout of 16.5 yen(about 20 cent). A child could enter a public bath for 4 mon and the prise of a sushi at that time was 8 mon. Improved the quality of ukiyo-e, the popularity and demand of ukiyo-e became higher, the price rose. The large size of woodblock printings were sold for 16, 18, or more than 20 mon. But the prices were almost same to the groceries. The pulisher produced exceptionally a bit expensive works including the ukiyo-e by Utagawa Kuniyoshi for 118 mon in 1840. Yet the Edo shogunate controlled the price of ukiyo-e to lower the people’s luxury for several times. Mizuno Tadakuni, the council of the shogun, made the rule that a ukiyo-e must have been sold less than 16 mon. This entry was posted in paintings, Ukiyoe-wood block printing and tagged beautiful women portrait, Edo Period, famous artist, genre, history, kabuki actor portrait, Katsushika Hokusai, landscape painting, Musha-e, nishiki-e, samurai, theme, ukiyo-e, Utagawa Hiroshige, utamaro, woodblock printings. Bookmark the permalink.